Spring is a time for group exhibits, applications for memberships to artist's guilds and writing the artist's statements and artist's resumés required for submission to such events and organizations. An abstract painting that was in process at the time, was caught in this flow of thought and became a self examination of its own. Starting with an action painting base, stroked, wiped, scarred and scratched to get a lumpy random texture the painting ended quite differently. 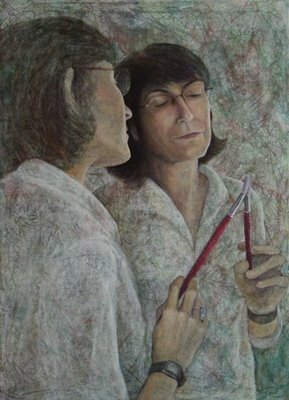 Many layers of gentle strokes and transparent color were gently laid, then sanded, and laid again to bring light to the faces and hands and detail to the brushes. If you're looking for meaning, the base painting is an abstraction of the actions of one's personal history. The artist emerges by the action of painting and sees herself in her work. The red brush and timepiece strapped to the wrist, signify the desire to accomplish something in this brief, limited life.